In her production of Rhesus, Katerina Evangelatos recreates the walks conducted by Aristotle in the 4th century BCE as he taught in his school. Translated and performed in Modern Greek with projected English translation, quotes from Aristotle himself are interjected at various points in the script, serving as an intellectual counterpoint to the violent action. 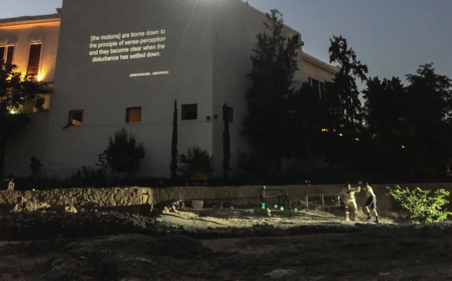 Subtitled “A peripatetic performance at Aristotle’s Lyceum,” this version of Euripides’ controversial dramatization of Book 10 of the Iliad takes its audience on an intellectual journey through time on a summer’s evening, creating a highlight of 2015’s annual Athens and Epidaurus Festival. Thought by some to be spuriously ascribed to Euripides, this tragedy tells the story of the death of the Thracian King Rhesus and the subsequent prophecy by his mother, the Muse Calliope, that her son would be resurrected, but only to live on in the underworld. Much of the controversy surrounding the disputation of authorship centers on stylistic and structural differences between Rhesus and other, indisputably Euripidean tragedies such as Medea and Orestes. It is perhaps this very ambiguity that led Director Katerina Evangelatos to adapt the play as an environmental piece and set it in Aristotle’s Lyceum (Figure 1). As Rhesus seems to ask more questions than it answers, it is fitting that it be performed in such a hallowed academic setting. I was first impressed by the choice to stage this show in a place known for logic and the acquisition of knowledge. Knowing the more famous version of this story told in book ten of the Iliad, subtitled “Marauding through the Night,” I entered the production with the question of how these two different conceptions would meld. By the end of the night I was thoroughly convinced by the storytelling of this wonderful production. The audience was divided into three groups before being led into the Lyceum, known as a peripatetic school because of Aristotle’s reputation for walking while teaching. I was placed in Group 3 with all other English-speaking patrons, who were seated where we would have the best view of the projected English titles used throughout the evening (Figure 2). As we entered there was a palpable sense of excitement, as through we were being led on a literal journey as well as a dramatic one. True to the original, the show has a male-only cast of ten, slightly smaller than one would expect of a Euripidean tragedy. With drums heralding the beginning of the show, the cast enters in a sort of semiformal processional that hints subtly at a Noh influence. The entirety of this parados adaptation is danced sans dialogue, with only an occasional quote from Aristotle projected to emphasize the physical storytelling. The men enter dressed in varying styles of late-nineteenth and early-twentieth century schoolboy costumes, carrying an assortment of toy weapons, which they use to act out a stylized version of the Trojan war. The juxtaposition of such boyish violence with philosophical reason suggests the duality of human nature, its seemingly innate drive towards barbarism tempered by logic and reason. The combination of drumming by Dimitris Desyllas’ percussion class from the Athens Conservatory and Choreography by Patricia Apergi works to create an exciting and effective beginning of the show. At varying points during Rhesus the action is interrupted by an interlude featuring the voice and text of Aristotle. The first of these occurs shortly after Dolon dresses as a wolf before being attacked and killed by Odysseus and Diomedes. Once again, Evangelatos adeptly punctuates the story with an instructional interlude before the brutality of war that will soon ensue, thus heightening the didactic quality of the experience. Under the direction of Katerina Evangelatos the ensemble cast creates a consistent performance that tells this story of aggression tempered by the intellect and philosophy of the ancients. The use of the childish costumes designed by Vasiliki Syrma along with the exaggerated toy props creates a playful environment while avoiding outright mockery. The juvenile mood is in stark contrast to the harsh reality of the archaeological site, which visually reinforces the overriding metaphor of duality posited by this production. Giorgos Tellos’ lighting is commendable, creating a versatile design in a large space with relatively minimal equipment. His lights seem to fade into the environment, enhancing rather than detracting from the ancient setting. The lighting also subtly and beautifully moves us through a show that begins at dusk and ends in darkness with a blackout that is an astounding spectacle in itself (Figure 3). The superb sound design by Kostas Michopoulos allows an audience spread out over several acres to hear the performers with a clarity that many traditional indoor venues would envy. Apart from its failure to use the concept of the peripatetic walk to its fullest potential, this production of Rhesus was a success, winning several ovations from the audience. 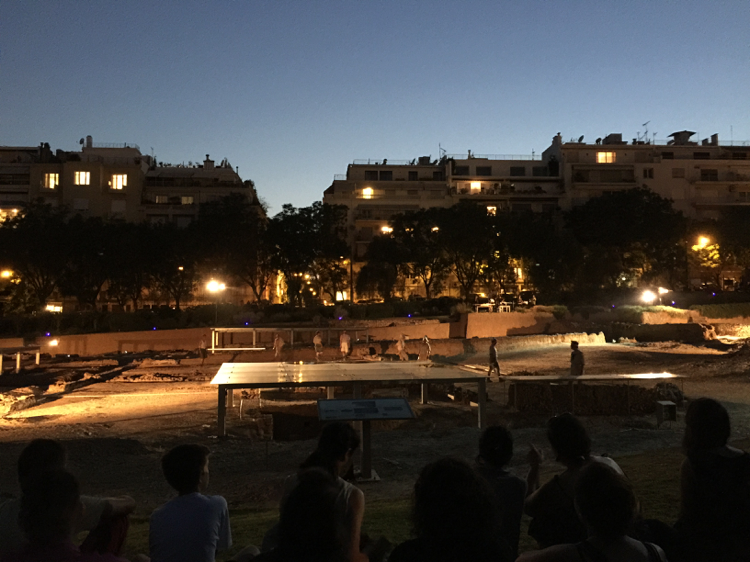 Among the dozens of performances at the Athens and Epidaurus Festival, Rhesus stands out for its environmental performance venue. 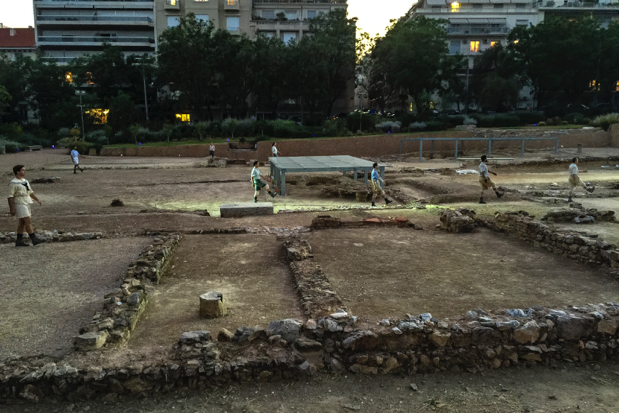 These ruins were only recently rediscovered and are a place of reverence for all academics and devotees of learning.